Last Sunday Chase and I woke up to everything frozen over and boy was it freezing! We hadn't planned to go shooting that day, but everything looked so beautiful I couldn't pass it up. Later that day we learned that people were even skating on a pond nearby that had frozen overnight! So cool:-). Luckily it's warmed up slightly since. During Black Friday I scored some crazy good deals on coats, including this stunning camel wrap coat by London Fog, that was less than $200. I don't know if any of you own a London Fog coat, but let me tell you, the quality is amazing and you just can't beat the price. Unfortunately, this particular one is no longer available online. However, I found a very similar one here for less than $150. I've also linked a few similar ones below! I feel like when it comes to owning a particular coat, a camel coat is an essential, whether it be a peacoat, blazer, trench coat, leather jacket, or robe coat - Camel is so timeless and versatile. I got the wrap coat specifically because I wanted to switch up my coats, since I usually always go for a peacoat or leather jacket. I'd love to know what style of coat you ladies are more drawn to? What I love about this grey with red/navy plaid turtleneck is that it's got plaid already attached to it. I'd say it's pretty much the best of both worlds. 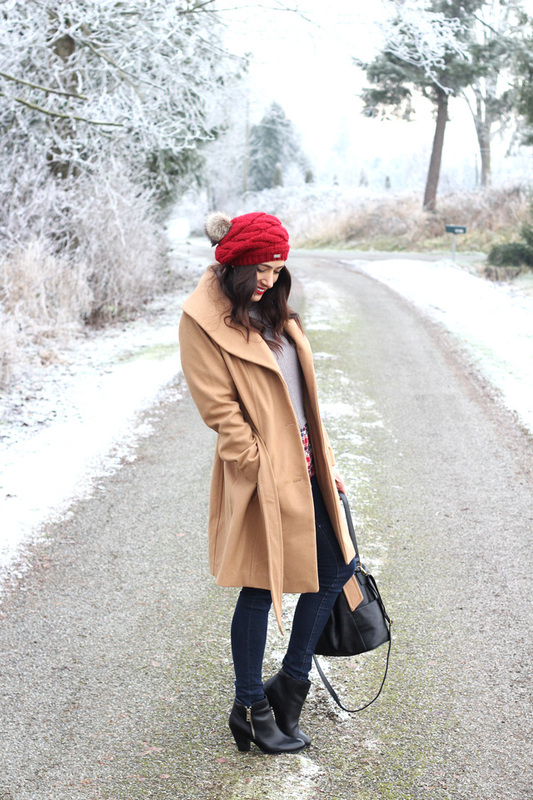 Also, this adorable red beret with fur pom is half off right now and on sale for only $22.50! For the longest time I tried to find the perfect matte red lipstick and finally found one I love by MAC, called "Ruby Woo". I also ensure I always use a liner before, or else I end up looking like a wacko, who doesn't know how to apply red lipstick. I use "Ruby Woo" lip pencil, by MAC. Wonderful 😍😍You Absolutely beautiful! Love your coat. How adorable and sweet do you look loving that beanie on you! Thanks Victoria! I'm obsessing over this cute beanie and it's definitely been keeping me nice and warm:-). Thanks so much for stopping by! Oh, you look absolutely lovely and I can only imagine what it must be like to wake up to a winter wonderland. We don't get winter here, unfortunately! It is so lovely! 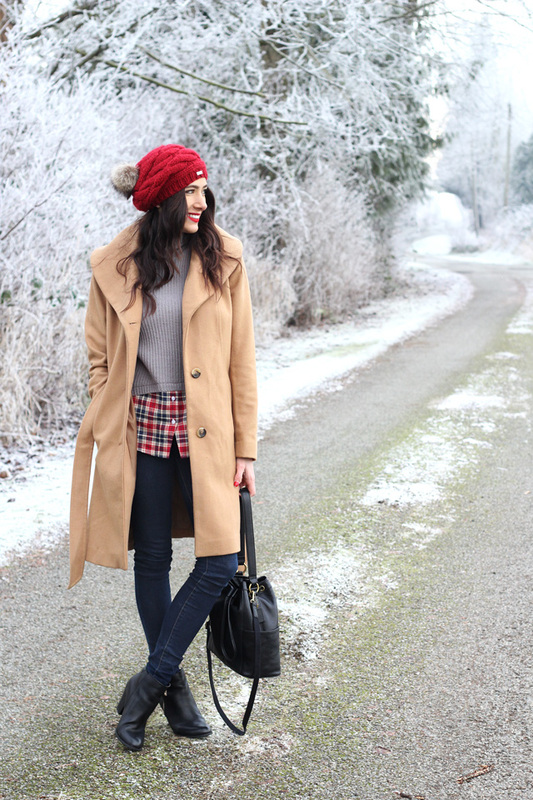 Your red and camel combo is perfect. I love the wrap coat you found. Thanks Amy! I just wish the coat was still available to get as It's super comfortable and you just can't beat the prices from London Fog. Hope you have a super fab weekend, sweetie! Love your outfit! 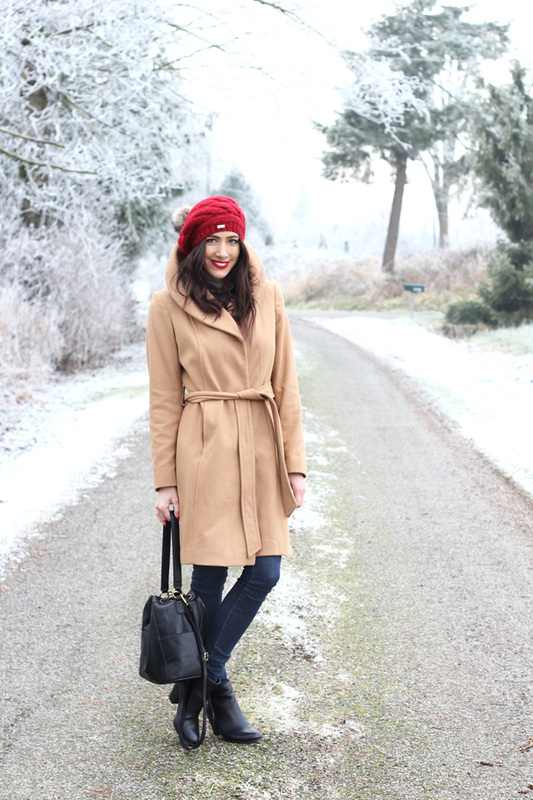 That camel coat is perfection and I'm swooning over that adorable beret. Hope you are staying warm! And she has done it again, Looking lovely as usual. I should come for all these clothes real soon, then I can be in your worry list. Wow, it all looks so pretty and you look beautiful! I absolutely love the plaid shirt peeking out from under your sweater! What a cute detail. Your pictures are gorgeous; this looks like it could be in a magazine! And the layering of the plaid shirt with the sweater looks amazing. I try to layer but it doesn't turn out very nicely haha. I use to be more for leather jackets, but lately I've been liking longer coats, although since it's not nearly as cold here there's not a lot of use for it. This outfit is stunning! Love the layers! 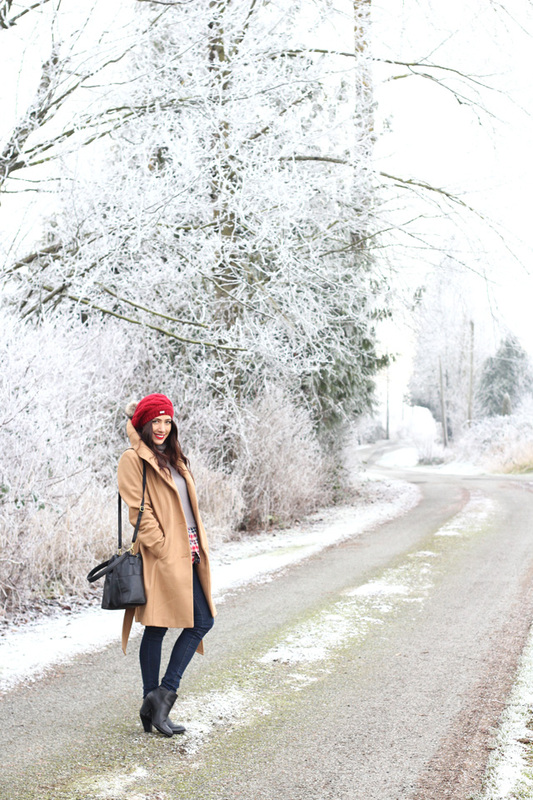 I am in love with this chic cold weather outfit! You look amazing! 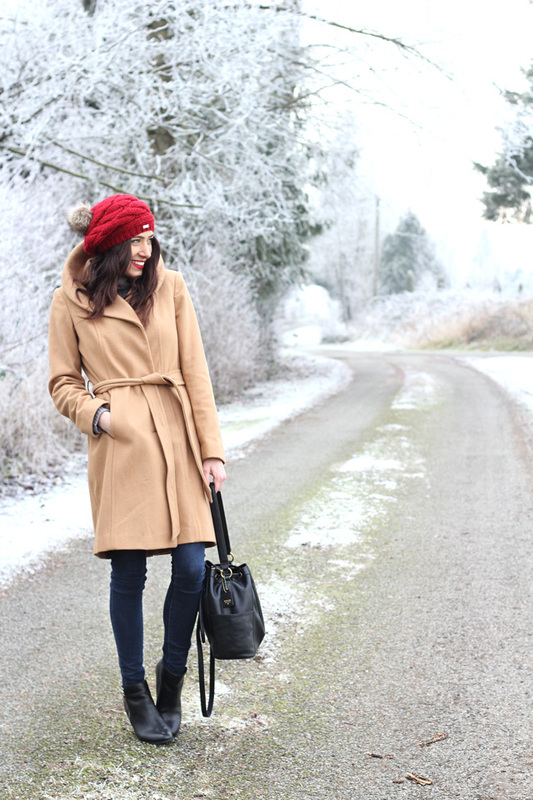 I agree, a camel coat in any style is timeless. What an amazing deal on this London Fog one. Serious score! Ugh, I wish we had a Winners. I want this shirt haha. It's so cool that the plaid is already attached. Too cute. You look so stunning with that coat, and your red lips is really attractive! Love it, have a nice day! Perfect color combo! looks very attractive! Ok seriously! Such an amazing jacket! Love this! Photos are amazing too! You look gorgeous! This is so picture perfect, you look stunning! 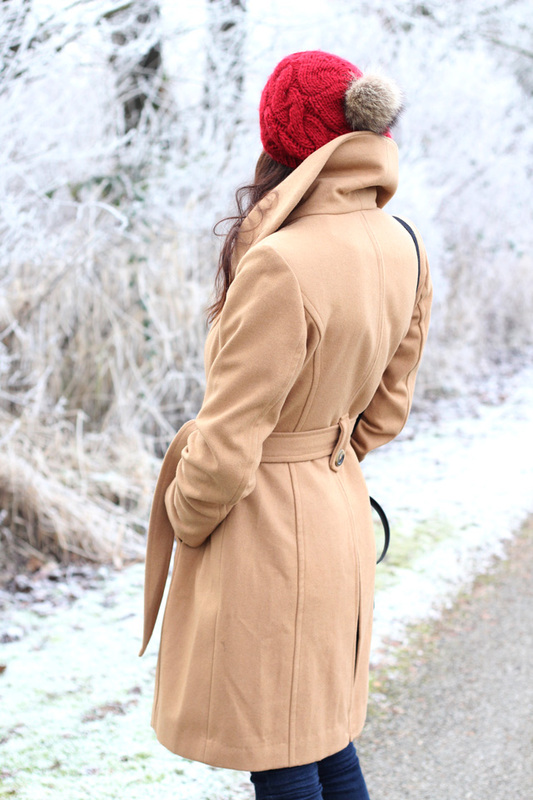 That camel coat is gorgeous! Thank you Hailey! It would look so good on you ! You look absolutely beautiful, as always, Ela! I adore everything about this look; the pops of red are perfect in adding some color and boldness to the look! I've heard so many great things about Ruby Woo, I need to try it out; it looks lovely on you! I hope you're having a wonderful start to your week so far, beauty, and thanks so much for sharing! Amazing outfit, love the coat and love that scenery in the back- perfect! 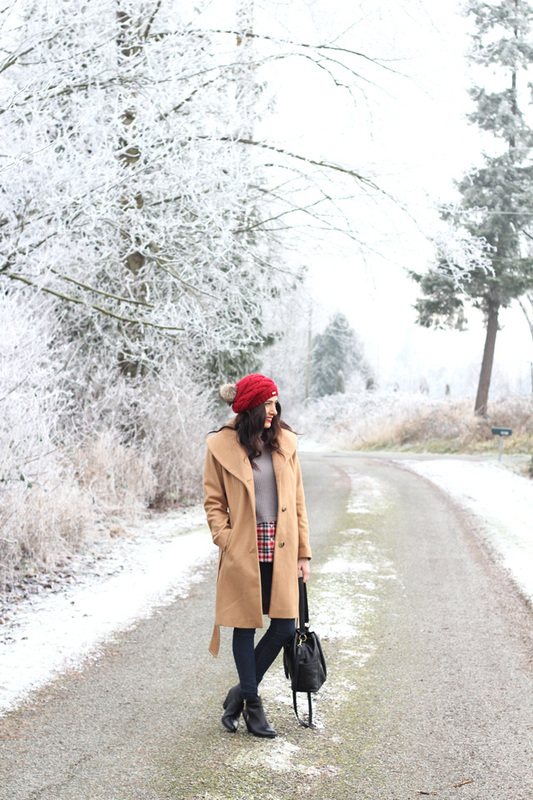 This is seriously one of my favorite winter outfits that I've seen :) so gorg!! I also can't wait to check out that red lip, I've been looking for the perfect one. Hope you're having a great day, Ela!! © THE ELA EDITION | All rights reserved.